Filled with astonishing detail, “The Flemish countryside” depicts a tranquil scene in the countryside of Flanders. The Flemish countryside portrays a small working mill, just to the right of an arched stone bridge. Far in the distance is the town itself. The meandering stream connects all the elements together vividly, leading to the ducks taking a swim in the foreground. To their left is a villager, who is looking back at the mill. He appears to be carrying a haversack over his shoulder, as if beginning a journey to a place unknown to anyone else but him. The lively foliage, striking composition and careful attention to detail makes this an enduring symbol of a simpler time. 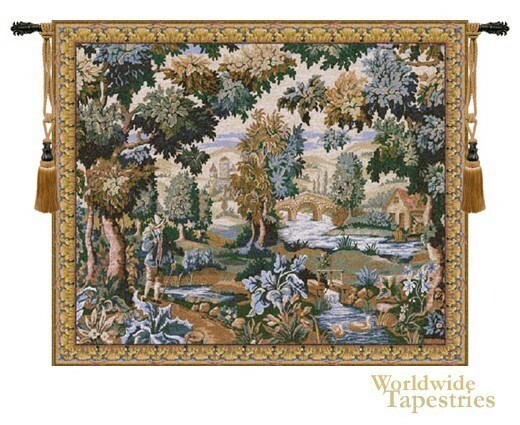 The Flemish countryside tapestry comes with a tunnel for easy hanging and is lined on the back. Note: tapestry rods and tassels, where pictured, are not included in the price. Dimensions: W 38" x H 45"